Home of the Pittsburgh Steelers for more than 30 years, Three Rivers Stadium was the site of many great Steeler’s teams. Prior to moving into Three Rivers Stadium the Steelers played at Forbes Field and Pitt Stadium. Forbes Field was built mainly for the Pittsburgh Pirates (MLB) in 1909. The Steelers began playing at Forbes Field during their first year of inception in 1933 playing here along with the Pittsburgh Pirates until 1963. The team then moved into Pitt Stadium, home of the University of Pittsburgh Panthers. Over time, both the Steelers and Pirates became dissatisfied with their homes. Like every other major metropolitan city in the late 1960s and 70s, Pittsburgh had to look to the future to maintain its Major League status. Therefore, Pittsburgh decided to build a multipurpose sports stadium. It was built where the Allegheny and Monongahela Rivers join to form the Ohio, thus getting its name Three Rivers Stadium. Construction began on April 25, 1968 and was not completed until July 1970 because of construction delays. The cost of the stadium was $55 million and seated 47,972 for baseball and 59,000 for football. The Steelers played their first game at Three Rivers Stadium on August 29, 1970 against the New York Giants. To convert the stadium from football to baseball moveable seats were used. Two banks of 4,000 ground level seats on the first and third base sides for baseball were moved and became 8,000, 50 yard line seats for football. Being a multipurpose stadium, tartan turf was the playing surface until 1982 when Astroturf was installed. Three Rivers Stadium was very colorful. When it opened all five seating levels were red and yellow. In the 1990s new blue seats were installed in the lower deck. One of the stadium’s most luxurious features was the Allegheny Club, a restaurant that accommodated 300 people for a view of the field and 400 people in the main dining area. The scoreboard was once located behind the endzone below the second level of seating, but was relocated above the upper deck. Just like in the 1960s, the Steelers began to lobby for a new state-of-the-art football stadium in the late 1990s. They succeeded and Heinz Field was built by the 2001 season. 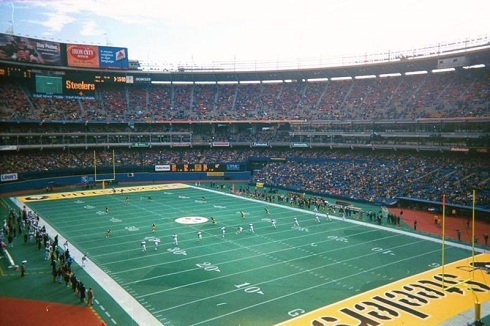 The Steelers last game at Three Rivers Stadium was on December 16, 2000. 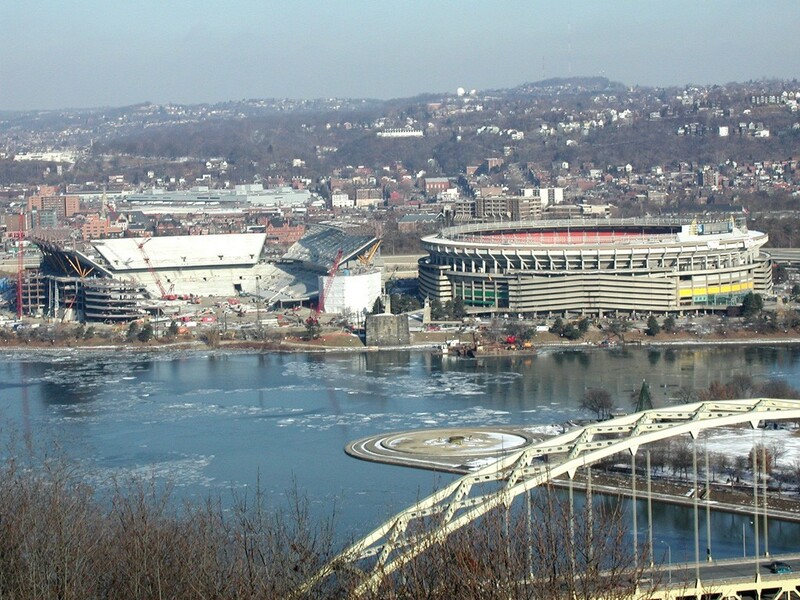 Three Rivers Stadium was demolished in February 2001.